Guitar World had an End Page feature for several years, which was basically a one-page obit with a picture of late, great guitarists’ final resting places. I wrote quite a few and will be re-posting some of my favorites. We start with one of the real pioneers of the electric guitar…. Born in 1910 in Linden, Texas, Aaron Thibeaux Walker began playing a variety of stringed instruments at an early age. As a teenager, he led Blind Lemon Jefferson from bar to bar as he played for tips, and received some lessons from the legendary acoustic bluesman. In 1933, he met and played with Charlie Christian and within a few years, both were pioneering the electric guitar, playing single-note, horn-influenced lines. It’s not clear who did so first, but by 1939 Walker and his bold, new toy were tearing up clubs in his new hometown, Los Angeles. Walker’s style was as unusual as his axe; he held his fat-bodied Gibson out in front of him, almost perpendicular. 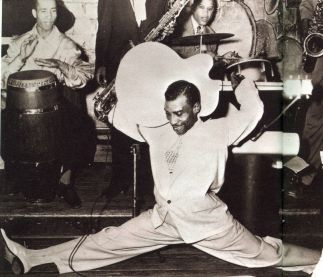 He also was the pioneer for guitar flamboyance, playing behind his back, and while doing splits. After some down years, Walker mounted a comeback in the late 60s, which led to a 1970 Grammy Award and frequent touring. 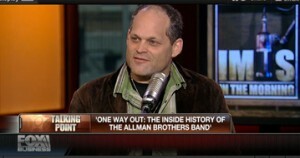 After years of health and drinking problems, Walker suffered a stroke in 1974. He died in Los Angeles on March 16. 1975, and is buried there, at the Inglewood Park Cemetery.